Matt Williams and I (Simon Fineman) started TOCC nearly four years ago. From the get-go we both believed TOCC could make a big difference to Oxfordshire’s woodlands, which has always been a huge imperative for both of us. We especially challenged ourselves to offer products made from local woodland thinnings, the by-product of routine, yet crucial woodland management. Today, as TOCC grows, we are using up to 500 cubic meters of thinnings a month – the equivalent of about 20 truckloads of ‘product’ that was once considered almost worthless. Even local woodland managers are now noticing we exist. Some folks intuitively dislike chainsaws but our friends in the forestry world (aka experts) are emphatic about the fact that responsibly worked woodlands are better for the environment, creating far higher levels of biodiversity. Matt and I are so happy that now log vendors are coming to us because they recognise the crucial role that locally manufactured charcoal can play in making their woodlands biodiverse, vibrant and economically viable. For TOCC customers too, this should make for a feel-good consumer experience. 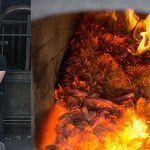 It is surely good to know that the coals you cook with were made with local woodlands – using a state of the art, low carbon emission kiln, and are helping to create work for a host of Oxfordshire woodland workers, who in turn help to drive a burgeoning rural economy. While some wish to help change the world by going on demonstrations or joining an NGO, for me it has been the idea of using the little bit of knowledge I was blessed with, to do something that might just make a tiny contribution in making our world into a better place. TOCC ticks that box. For those of you that already buy from TOCC you probably do so because of the great charcoal we make – which is obviously good to know – but we want you to also be aware that there is the environmental backdrop in your choice as consumers. That really matters to us… so a great thank you from everyone at The Oxford Charcoal Company, and all the stakeholders in our great Oxfordshire woodlands.